What a year, right? I hesitate to dwell too much on world events in this space, other than to acknowledge that we have all experienced them, have all no doubt been rocked by them in one way or another. If you’ve read this site for any amount of time, you know by now that I especially have a hard time commenting on the music without acknowledging the context into which it was created — whether that be the birth of a child, the dissolution of a marriage, the surprising outcome of an election, the uprising of indigenous people, or so on. Doing so would be like considering a person’s life story without acknowledging the circumstances into which they were born. The determination to make any kind of art in times of uncertainty is a defiance of the very real impulse to keep one’s mouth shut in such moments. The decision to make music specifically — a task which requires that one stand up and be seen and heard, perhaps with others of like mind — is itself a defiant act, whether one is speaking truth to power or in some other direction. I would argue, and have, that the choice to speak up without commenting on world events is still a response to those events. It is still a declaration of courage and determination, a reaching out. When we purchase the album or sing the song to ourselves or go quiet at the show and let the singer have our attention, we are that hand on the other side. Shedding light on such things has long been part of the gig here at No Depression and FreshGrass, and we’ve gone through some evolutions of our own this year. We end the year with some new staff, having gone nonprofit and launched a writing fellowship. We published four print journals this year (and will continue to do so) that told the stories of giants like Sister Rosetta Tharpe, Guy Carawan, the Weavers, David Grisman, Levon Helm, and others. They also lifted up newer folks like Kaia Kater, Parsonsfield, Pokey LaFarge, Dori Freeman, and the list goes on. Placing our quarterly print journal at the fore, we deepened our commitment to deep-digging investigative music reporting — stories that don’t just tell you what to listen to, but that dig into the roots of this music and explore how what you’re hearing today is connected to the long chain of American music. Though it can be gratifying to follow trends, it’s more deeply fulfilling to be reminded of who we are at the core, what traditions brought us to this moment, where those traditions began, and where heeding them might yet take us. In the realm of music on which we’ve fixed our gaze, it’s been a year full of truly great songwriting. For starters, there was Sturgill Simpson’s A Sailor’s Guide to Earth, which he wrote as a sort of instruction manual to his newborn son. The deeply personal album by one of country’s most deep-thinking songwriters drew awe from some and apathy from others but still came out on top as our readers’ favorite album of the year. As some brand of nostalgia swirled around our politics, so it also did in our music. The Cactus Blossoms showed up, seemingly out of nowhere, with delicious brother harmonies on songs like “Stoplight Kisses,” that felt like a rebirth of the Everly Brothers. Margo Price’s “Hurtin (On the Bottle)” felt like a branch straight out of the long-ago outlaw country tree. Nashville songwriter Lori McKenna got old-school simple and direct with “Humble and Kind,” which I’d argue is the most important song for anyone to listen to this year. Parker Millsap went topical, among other ways, by reviving the old spiritual and civil rights anthem “You’ve Got to Move,” with the grumbling growl of a beast awakened after a half-century slumber. 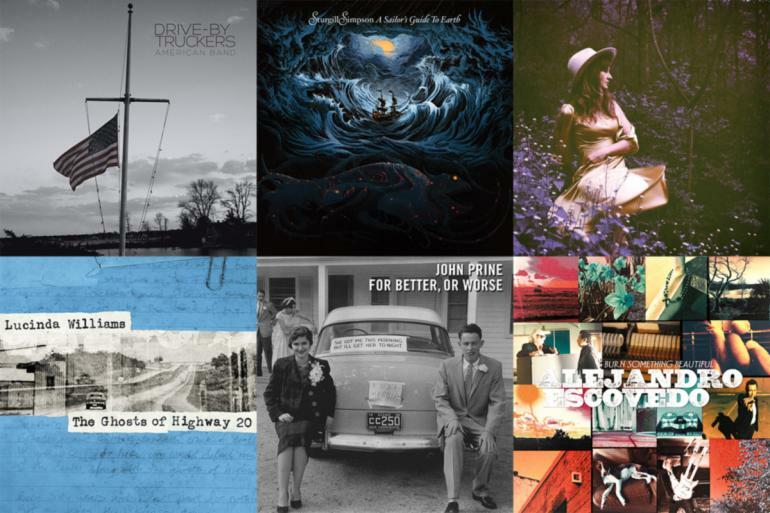 Beyond individual songs, we got richly empathic, deeply moving albums from Lucinda Williams and Hayes Carll, and some determinedly personal explorations from singer-songwriters like Elizabeth Cook, Amanda Shires, Sara Watkins, and Sarah Jarosz. Meanwhile, innovators like Sierra Hull, Hiss Golden Messenger, Paul Simon, and Aoife O’Donovan pulled together rhythm, melody, and instrumentation in ways that expanded our understanding of what can be done with soundscapes and lyricism. Unfortunately, we also lost some giants this year: Merle Haggard, Guy Clark, Leonard Cohen, Prince, David Bowie, and others. Though the last two I named weren’t directly tied to American roots music, they both certainly moved many of its performers and pulled in some of its elements. And that is the glory of this kind of music: These old songs and styles are anything but set in their ways. What has been said and done and figured out and surmounted before is always there for us to find and brush off and revitalize and use anew. There’s not an album on the list below that hasn’t done that with care and great intention. So, without further ado, I give you the Top 50 Albums of 2016, as chosen by ND readers.